Don't miss our latest newsletter, packed with information on two great new green teas; our latest gaiwan, the Black Jade; delicious iced teas for summer; and more! We're excited about green tea from Shaanxi Province, enjoyed by "tea sage" Lu Yu but little known today, and a rare, exotic albino variety that we call Imperial Ivory. Be sure to subscribe to the newsletter for all the latest updates. Our latest newsletter is full of news about the latest spring tea, an update on Roy's next trip to Asia later this month, and more. Most exciting, the 2010 editions of Bi Luo Chun, Imperial Green, Imperial Bai Hao Yin Zhen (Silver Needle), Organic Purple Bamboo, and Hong Mei Mao Feng are all in the teahouse and our online store now, with more great spring teas arriving soon. Be sure to subscribe to the newsletter so all the latest updates are conveniently delivered to your inbox! Spring Harvest: Is Earlier Still Better? During the last few years, I have often pondered if earlier harvested tea is always better. Given the current global environmental issues, weather patterns are changing - sometimes drastically. Tea-growing regions from China to India have been affected. This year, the impact on major growing regions has been devastating. The late frost caused damage in Eastern China's Zhejiang, Anhui, Fujian, and Guangdong provinces. Production and quality are both lower, yet with high demand and less supply, prices are on the rise. Chinese tea farmers have been cross-breeding tea to yield earlier harvests because, according to conventional wisdom, the earlier the pick, the higher the value. Traditionally tea bushes are trimmed prior to winter to encourage spring growth and avoid winter frost damage. Fertilizer is applied in the fall so that over the winter, soil bacteria can work their magic, building up just the right kinds of nutrients and soil texture the awakening plants will need as the weather warms. When all conditions are right, the plants' first young leaves are the tastiest and most nutritious, since the bushes had the whole winter to prepare that valuable first growth. However, with the new, earlier-yielding hybridized teas, plus the fact that some farmers fertilize right after winter for an additional push, spring tea is being picked earlier than ever. Couple that with unpredictable climatic conditions you can see that the type of "disaster" experienced this spring threatens to become the new norm. Starting last year, we stopped fertilizing in early March, fearing that it not only pushed leaves out too soon, but could also weaken the plants with a growth spurt at the wrong time. As those of you following this blog may know, in 2009 and 2010 we've have had two of the largest and best harvests of Imperial Lotus Heart Dragon Well in recent memory. I have also continued to purchase our Imperial Green Tea from its high-altitude home even though cheaper alternatives abound at lower elevations. This year's Imperial Green, which will be available for purchase later this week, was allowed to grow at nature's pace and therefore prospered. The result makes both our farmer and me very happy. During a disastrous year, we've fared rather well. Taking the same approach, I declined the earliest submission of our popular Imperial Green Oolong from Taiwan's famed Shan Lin Xi area. The early harvest is not so great compared to what is expected of our Imperial standard for this tea. I have opted to wait for higher-altitude Taiwan oolong in mid-May, in keeping with the traditional schedule for spring harvest. I anticipate that these teas will be abundant and at their best when I visit Taiwan May 18. I hope to bring you good news! As I write this, I realize once again that people in traditional businesses should look to tradition! When something has been done a certain way for hundreds - perhaps thousands - of years without changes, there are usually a few very good reasons. There is a natural cycle to cultivation and plant life that is best left undisturbed. I always say, when in doubt look back in history. Not so long ago, sustainable farming was an everyday way of life, not a buzzword. It's no accident that when humans disrupt that delicate balance the outcome is often not what is intended. History points the way; we should pay attention. 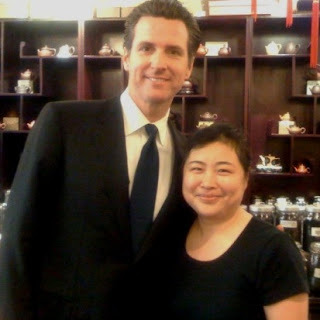 We always welcome guests at the teahouse, but there was a bit of extra excitement this afternoon when San Francisco Mayor Gavin Newsom dropped in at the Ferry Building for a visit and a photo op with Grace. The mayor started with a slight faux pas, entering with a coffee cup in hand, but quickly apologized and replaced the coffee with to-go order of our delicious new gu zhang mao jian. Showing himself to be a true tea lover, he also bought a taster packet of Imperial Lotus Heart Dragon Well to drink later. Great news for green tea lovers: the 2010 edition of two of our finest perennial favorites are now enroute from China and should be arriving in the teahouse in just a few days. One of our most popular spring teas, year in and year out, is our reliably fresh and flavorful Imperial Green Tea. The other selection, bi luo chun, hardly needs an introduction, as it's among the most famous of all Chinese green teas. This legendary, "astonishingly fragrant" tea from Jiangsu Province, with its tiny, downy, spiral-shaped leaves, has been beloved by emperors and ordinary tea drinkers alike for centuries. The same shipment includes a single-tipped hong mei mao feng black tea that Roy specially commissioned to be produced by traditional methods, including total oxidation of the leaves that produces a deep red liquor and potent, dried plum flavor. Stay tuned, we'll post photos and more details on the blog as soon as the new teas are available.